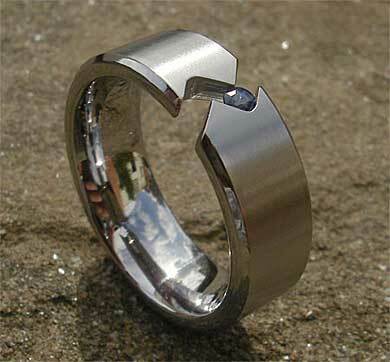 Titanium Sapphire Engagement Ring : LOVE2HAVE in the UK! This titanium sapphire engagement ring measures 7mm wide and as you can see from the pictures has a tension set coloured sapphire, so it makes an excellent choice for a ladies engagement ring. The profiling also has a slightly chamfered edging adding to the designer styling. The engagement rings pictured on this page feature the blue and pink sapphires, together with the choice of satin and polished finishes. 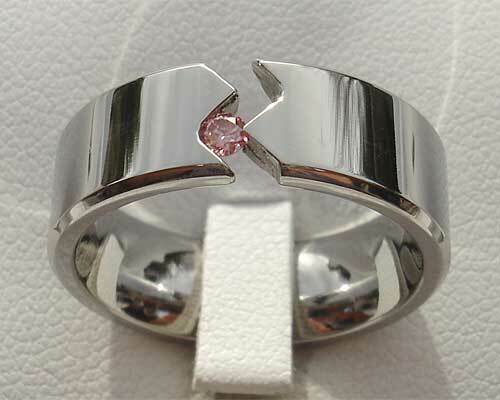 Of all our tension set titanium rings our zig-zag rings are the most unusual of them all. A green sapphire is also available too, and these engagement rings are the sapphire versions of the black or white diamond one we also sell on this website. 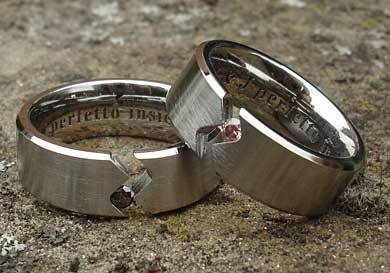 All the stones are 2.5mm/0.06 carat in size. Stunning modern looks for an engagement ring with a real difference. Please indicate your choice of sapphire colour into the comments box at checkout. Precious stone(s) Available: 1 x 2.5mm/0.06ct blue, pink or green sapphire.